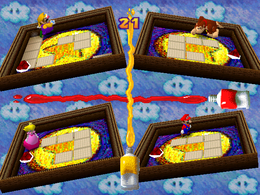 Tipsy Tourney is a 4-player minigame in Mario Party and Mario Party 2. Its name may be a pun on the phrase "topsy-turvy". Four of the players have their own screen, standing at their own separate frame. The background in the minigame from Mario Party resembles a set of clouds with eyes that have been drawing with crayons, while Mario Party 2's background contains a darker tone of the sky and a small amount of clouds and stars. The minigame then starts. The objective of the mini-game is to uncover all the tiles on the frame with a Koopa Shell within thirty seconds. 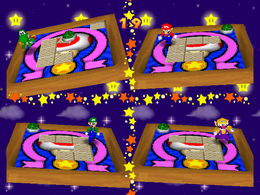 The players have to tilt the frame and let the Koopa Shell slide over the tiles to remove them. If the Koopa Shell bumps towards the player, he or she will be stunned for within a moment. The first player who uncovers the picture frame will win the minigame. Mario Party's image contains a Coin, while Mario Party 2's image contains the animated head of a Toad. The minigame can be purchased from the Mini-Game House for 350 Coins. Game Rules – "Tilt the frame to slide the shell, revealing the picture beneath the panels. Uncover the whole picture." Advice – "The closer to the edge you go, the bigger the angle of tilt." Game Rules – "Tip the picture frame up and down, left and right to clear the panels and reveal the picture beneath!" Advice – "The closer to the frame's edge you go, the greater the tilt and the faster the roll." This page was last edited on August 19, 2018, at 18:37.